The Nelson days are longer, the temperature has warmed, and you only need to look at the beautiful new growth on all the plants in my vegetable garden to know that spring is well and truly upon us. Among the flourishing plants are my rows of strawberries. Having covered them over the weekend to protect them from the enthusiastic bird life, we’re also fortunate to have. I’m now waiting for the many flowers to develop into delicious, fresh strawberries, (the first of the berries to appear in my garden). Strawberries are a great source of Vitamin C and K, as well as a superb source of fibre, folic acid, manganese and potassium. They also contain significant amounts of phytonutrients and flavonoids (which makes them bright red). Strawberries are great on their own, with whipped cream, dipped in chocolate, or to top your best Pavlova. 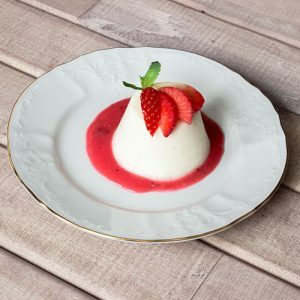 I love a good Pannacotta, and fresh strawberries accompany this recipe beautifully. The silky smooth texture of the dessert, when paired with the delicate, sweet flavour of the berries is just divine. Head down to Fresh Choice Nelson to pick up your spring produce, including a punnet or two of delicious, new season strawberries! Heat the cream, milk, sugar and limoncello to an almost boil, then allow to simmer for 30 seconds. Then remove from the heat, skim any skin that forms and add the gelatine leaves. Gently mix until you reach a silky-smooth consistency. Cool the mixture in an ice bath for about 20 minutes before transferring into individual moulds. Allow to set in a refrigerator for at least two hours. Dice the strawberries into fine cubes, and top the finished Pannacotta with the diced fruit. Enjoy as is, or add a scoop of gelato. Heat the sugar, lemon juice and water in a saucepan. Simmer for three minutes and allow to cool completely. Mix in the buttermilk and churn in an ice cream machine. If you don’t have an ice cream machine, it is possible to freeze the mixture in a bowl. Just remember to stir frequently to prevent it crystallising and freezing solid. Copyright Fresh Choice Nelson © 2019 · Site by Kate Coote.